Greetings from Switzerland everyone! Kathryn, Lachlan, Emma and I arrived about 36 hours ago (Monday, Aug 13), and have been holed up in our temporary apartment in Vevey, where we have been trying to shake off the jetlag. Our flight to Geneva was uneventful, and most of us grabbed at least a few hours sleep on the trip over. 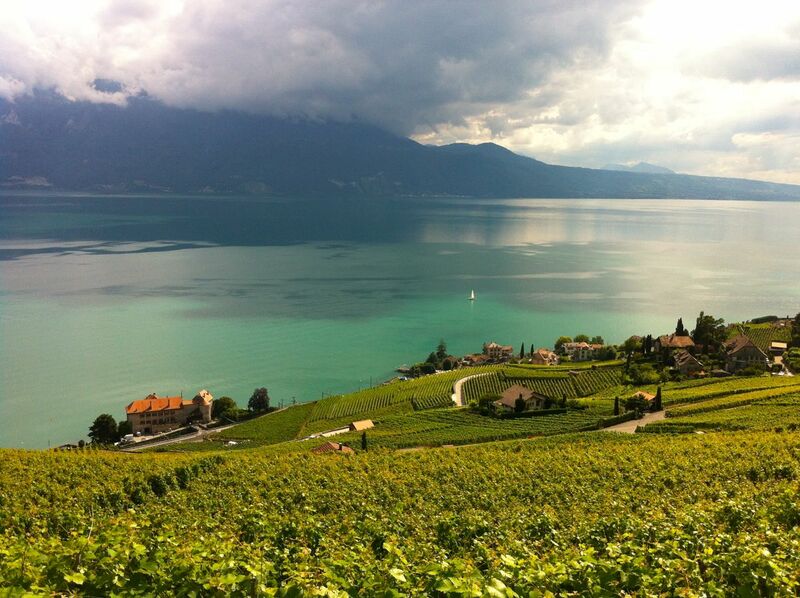 Given 9 suitcases and the drowsy state we were in, we were very fortunate to have a driver from Nestle pick us up and whisk us off to Vevey, which is located about 90kms east along Lake Geneva. 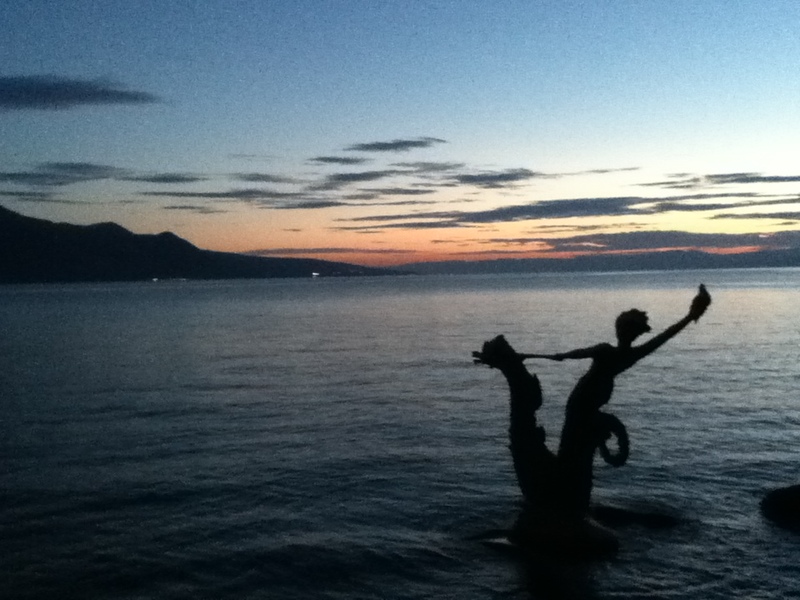 After our arrival, Lachlan and Emma reacquainted themselves with the apartment, which is located in downtown Vevey (pop. 15,000), while Kathryn and I unpacked. By late afternoon, however, both of the kids had succumbed to the jetlag and were fast asleep. Emma woke up in time to share a light dinner with Kathryn and I before we all made our way to bed. Lachlan and Emma enjoying a bowl of pasta before 7 a.m. Unfortunately, given all the sleep they’d had the previous afternoon, both Emma and Lachlan were wide awake and hungry by 3 a.m. on Tuesday morning! Kathryn managed to keep them quiet and occupied until I woke up at 6 a.m., only to find the kids making a pot of pasta and sauce! Unfortunately for Kathryn, she had a full day of work ahead at the Nestle office, poor thing! This morning I went for a run along the stunningly beautiful shoreline promenade that runs from Vevey to the neighbouring town of Tour-de-Peilz (pronounced “toor de peh”). Back at the apartment the kids were up and reading or catching up on some screen time. Lachlan even managed to connect with a few friends in Toronto via Skype, despite the late hour there (names withheld upon request). Later on we visited the local pet store to purchase a new cage and accessories for our three Guinea Pigs (Boo, Pumpkin and Holly), who are due to arrive from Toronto tomorrow! A big “Thank You” to the Nestle relocation folks for arranging their trip over. Hopefully we will all have recovered from the jetlag by tomorrow and can begin to settle into a bit of a routine. Kathryn will be back at work, and the kids and I will busy ourselves with a variety of settling-in tasks, including getting our residence permits. Tomorrow night we have a dinner with our “Buddy family” from the International School of Lausanne – the Lowins – who have kindly invited us for a visit. The kids are also eager to connect with the local soccer (Emma) and football (Lachlan) teams that they will be training with this fall. Also on the agenda this week is a visit and a swim at the home we have rented in Jouxtens-Mezery, just on the outskirts of Lausanne (more on this later). While we won’t move in until our sea container arrives in a few weeks, we are all eager to go for a dip in the pool! Well, better sign off and get some sleep! I will update again in a few days, including some more information and photos from the Vevey area. Please forgive the clumsy blog layout, I am still getting used to the software. I’ll also see if I can recruit Kathryn, Lachlan and Emma to provide some content! Starbucks for an early morning coffee and a browse at Chapters. Yes, Guinea Pigs arrived safe and sound last night just before dinner. They seem to be enjoying their new surroundings and larger cage (thanks to Swiss animal welfare regulations!). I wonder if they are suffering from culture shock with all the new sights, sounds, smells and tastes? does that mean you are feeding them swiss cheese?